"This bar cookie is an old fashioned favorite. 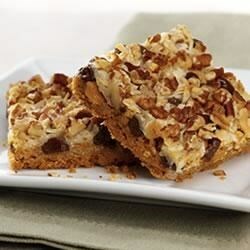 Chocolate chips, nuts and coconut are set in a caramelized layer on top of a graham cracker crust." 7-Layer Magic Cookie Bars: Substitute 1 cup (6-ounces) butterscotch flavored chips* for 1 cup semi-sweet chocolate chips and proceed as directed above. Peanut butter flavored chips or white chocolate chips may be substituted for butterscotch flavored chips. Magic Peanut Cookie Bars: Substitute 2 cups (about 3/4 pound) chocolate-covered peanuts for semi-sweet chocolate chips and chopped nuts. Magic Rainbow Cookie Bars: Substitute 2 cups plain candy-coated chocolate candies for semi-sweet chocolate chips. I just think these cookies have way too many chocolate chips. If you reduce the chocolate chips to 1 and 1/4 cups it is much better and then worthy of five stars, but not as is.